We only provide SEO services for websites we’ve built. We do not provide SEO services for websites that weren’t built by us for several reasons. On Site Optimization: On-site optimization is the stuff we do while we’re building your website. This is the “internal” optimization of your pages, written content and photos. Install & Setup Genesis Framework. Install & Setup Google Analytics. We Write unique titles for each page. We Write unique meta description for each page. We Write unique meta keywords for each page. We Write Image ALT tags for every image on your site. We Develop keyword targeted content for every page. Proper setup of H1, H2 and H3 header tags. 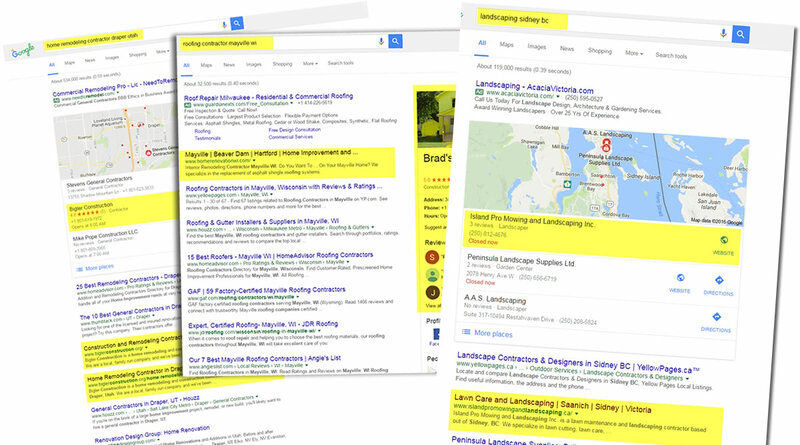 Off Site Optimization: Off-Site optimization is the stuff we do outside of your website, such as setting up your local listings, and building up your citations. Setup Google Webmaster Tools – We’ll verify your website with Google Webmaster Tools which allows us to submit your sitemap and help get your website and all of it’s pages indexed more thoroughly. Setup Google + For Business – This is the other part to your Google Local search branding. Setup Yahoo Local – This lets the Yahoo search engine know your business exists and will appear in the Yahoo local search engine. Setup Bing Local – This lets the Bing search engine know your business exists and will appear in the Bing local search engine. Setup Yelp Local – This is your Yelp listing which allows your customers to leave feedback on your service. Setup Facebook Business Page – This is your Facebook Fanpage. Facebook now plays an important role in helping websites rank for their keywords locally.